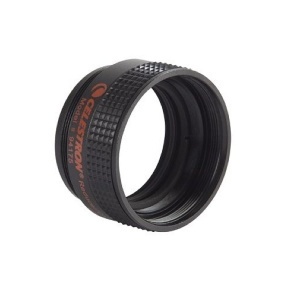 This combination focal reducer and field corrector lens accessory works with all Celestron 5", 8", 9 1/4", 11" and 14" Schmidt-Cassegrain telescopes. This clever accessory makes it possible to have a dual focal ratio instrument, without sacrificing image quality. The Reducer/Corrector is f/6.3 for C5, C8, C9¼ and C11 telescopes and f/7 for the C14 telescope. If offers wide fields of view with any Schmidt-Cassegrain telescope. Used for astrophotography, it reduces exposure time by a factor of 3. Celestron doesn’t offer a f/6.3 Schmidt-Cassegrain telescope, because the design is impractical, with a large central obstruction, and resulting loss in contrast. This, added to the inability to utilize longer focal ratios for certain objects, led Celestron to design the four-element, fully multicoated f/6.3 Reducer/Corrector. Results are amazing both visually and photographically.